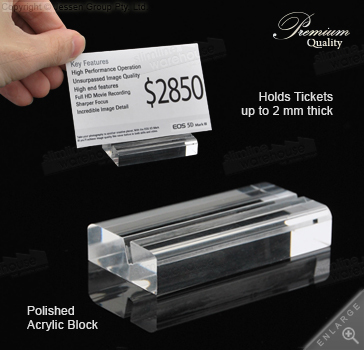 The Acrylic Ticket Display is a Premium Quality Block that Holds up to 2mm Thick Cards! 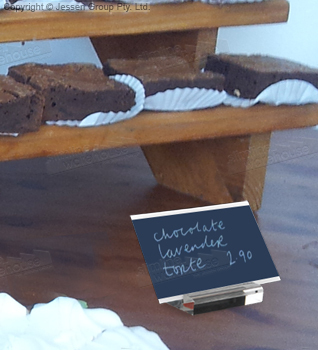 Lightweight display features small footprint to place signs without taking up much space! An acrylic ticket display features a slanted inner channel that holds your cards that are up to 2mm thick easily for view. By utilising a slanted channel, the plastic sign holders make it easier to read what is on the card for passersby to more readily read what is shown on the graphics! This retail sign holder, acrylic ticket display is made of 10mm clear acrylic for an impressive looking stand that works well within any décor. The polished edges provide a stylish look that works well to help capture attention when placed in many different businesses. Cafes can place cards next to baked goods to describe what they are, jewelry stores can denote different brands in style, and retail stores can place pricing information and specs on cards next to merchandise with ease! This display is lightweight with a small footprint, allowing it to be placed on counters, shelves, desks, and tables with ease. Switching graphics out is easy as well, as cards are easily placed within the channel without any hassle or tools needed. Order one of these quality plastic card holders today to place around your business to relay information to potential clients and customers in style! Due to reduced pricing, minimum order is based on 10 units. The different clear plastic displays that we offer provide your business with an easy way to market to customers in style without breaking the bank. There is a wide variety of items for you to choose from that are made from premium quality acrylic that provides a stylish look without breaking the bank! Browse our extensive online catalogue to see the hundreds of displays that we offer in a wide variety of different categories that are suitable for many different businesses. 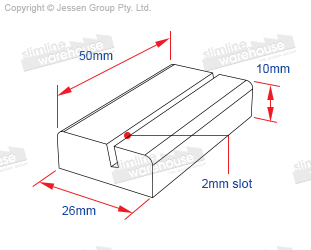 Slimline Warehouse is a national leader in POP, POS, retail, & exhibition displays, with same day despatch offered with most in stock items purchased by 1pm EST. Order today from anywhere in Australia, including, Sydney, Canberra, Melbourne, Perth, Adelaide, Toowoomba, Bendigo, Brisbane, & Gold Coast!